A couple of months back, we launched the Custom Sections Directory feature in Google News to allow users to set up sections on topics of their interest, and to share them with other users. Today, we are giving users even more options for following stories. Users can mark a story cluster by clicking on the star next to it, like they can with messages in Gmail and items in Google Reader. When you star a story in Google News, it's one way to let us know that you're interested in that subject. When there are significant updates, we will alert you by putting the headline in bold so you can get more information. 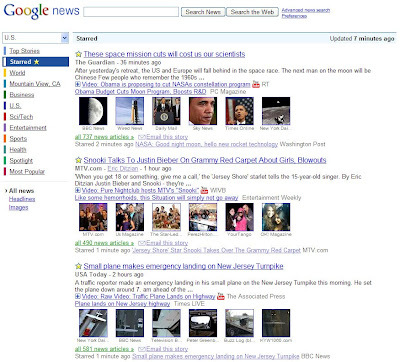 You can also follow your 20 most recent starred stories in the "Starred" section of Google News. We hope you enjoy the new feature and welcome your feedback.